Can I resist a product named for the queen of the gods? I can not. Well, I don’t know for certain whether Sunday Riley had ancient Roman mythology on her mind when she created Juno, but that’s what the name means to me, in any case. 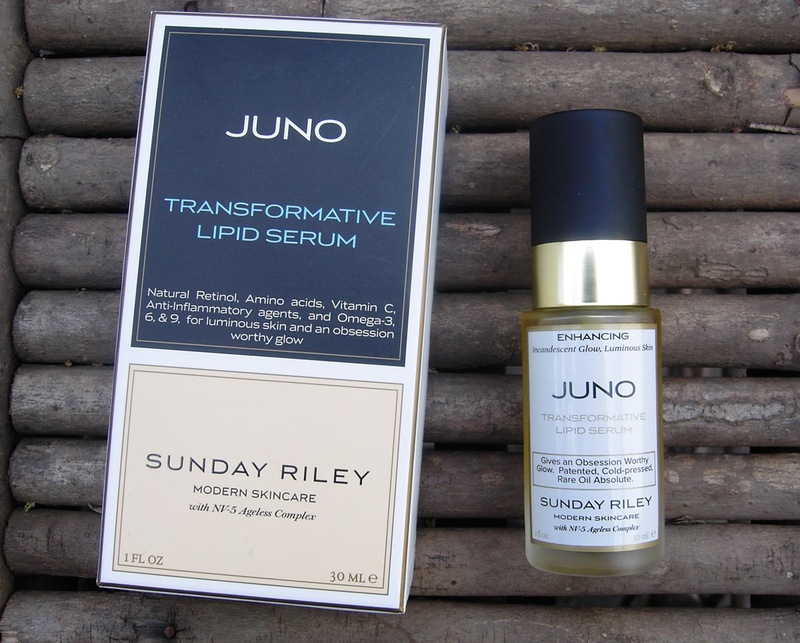 To start at the beginning: when Juno made its appearance as the signature product in Sunday Riley’s skincare line, I did manage to ignore it for a little while. It was very expensive, after all, and I didn’t really have a clear idea of the company yet, and I was still leery of using oil-based products on my face. But a small vial of Juno made its way into some gift-with-purchase sample bag, and I used it up…and a second sample came my way, and I used that one up, too. Then Sunday Riley came to Bergdorf Goodman, where I became more familiar with the line’s products, and I eventually ended up going home with a full-sized Juno. Juno is a concentrated skin serum made from plant-derived ingredients. The full list includes oils of acai seed, argan, black cumin seed, blackberry seed, blueberry seed, broccoli seed, carrot seed, chardonnay grape seed, cranberry seed, marula, meadowfoam seed, oomegranate seed, and red raspberry. The finished product has a golden color and a scent like dried oregano. I’d been unintentionally abusing my skin last winter and spring by cleansing too often and too aggressively, so that I was left with dryness and dehydration resulting from a loss of lipids. I’m in the process of re-building my skin’s natural protective layer, and Juno has been the important first step. It’s easy to layer or mix with other products: in the morning, I apply a small amount of Juno to bare skin, patting it into my face with my fingertips before applying moisturizer and sunblock. In the evening, I blend one pump of Juno with one pump of moisturizer. My skin tolerates Juno well and is already showing signs of improvement: it feels smoother and more resilient, and it looks clearer and less reddened. I’ve conquered my fear of oil-based products, because I’ve realized that everything depends on the oils in question, and because my skin actually feels less oily now that I’m not over-exfoliating and stripping it dry twice a day. I may never have a perfect, goddess-like complexion, but Juno has definitely benefited my skin over the past few months. Reviews of other skincare products from Sunday Riley to follow in the weeks ahead! Sunday Riley’s Juno Transformative Lipid Serum ($125) is available at the Sunday Riley website, Sephora (online only), Barneys, and Bergdorf Goodman. Bergdorf is my favorite location; Stacie, the counter manager, can be contacted at phone at 212-872-8635. Disclaimer: this product was purchased by the reviewer. 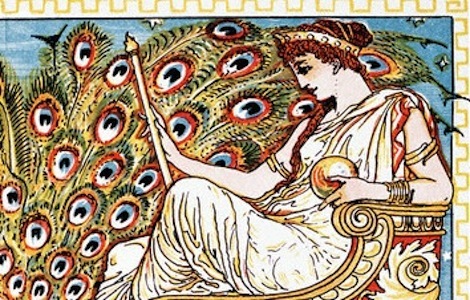 Images: Walter Crane, detail of The Peacock’s Complaint (1887), via Corbis; product photograph by Tinsel Creation.